1. The Old Glory oak tree still stands! 2. There is agreement between the government, the developer and the citizens that Old Glory should be preserved. However, there is still a debate on how best to save Old Glory. 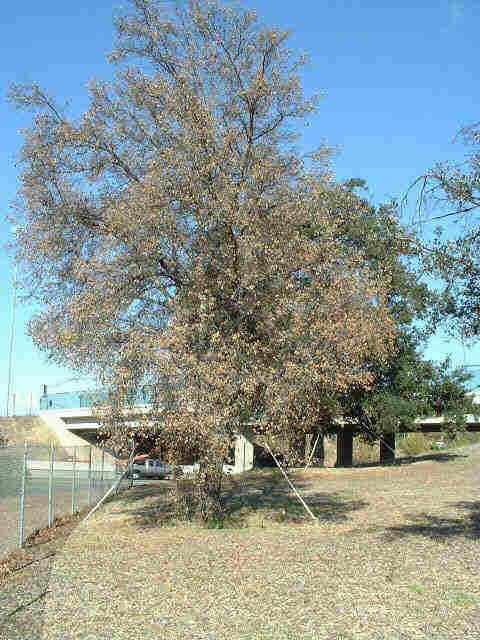 County Supervisor Michael Antonovich has proposed that the tree be moved. Common sense and a consensus of certified arborists says that moving such a large old tree would kill it, and not accomplish this goal. Both the developer John Laing Homes and engineers working with the Old Glory Coalition have submitted viable alternate road plans. These plans would enable the road expansion the county says is necessary, while preserving Old Glory where she has stood for 400 years. However, the abrupt rejection of the alternatives by the County Public Works Department as unorthodox and therfore unsafe does not stand up to close inspection. The County's plan by comparison calls for a high speed and high capacity roadway which will pass through several uncontrolled intersections directly to the doorstep of an elementary school. If safety were truly his concern, Supervisor Antonovich would exercise real leadership and direct the creation of a community friendly road and not a dangerous expressway. The friends of Old Glory are standing firm. The spirit of the community will not be broken by bureaucratic inflexibility and political arrogance. This campaign is about real democracy and the power of the people to determine their future, however long it takes. I want to acknowledge the hundreds of volunteers who continue to help in ground support and at the Old Glory Education Center, all the businesses that have donated food, supplies and services, the politicians with the courage to go on record including Santa Clarita City Council, Lt. Gov. Bustamante and Los Angeles Mayor James Hahn, and most especially the children of the community who come nearly every day to offer encouragement. I gave my word to the children that I would be here to the end and I will. John Laing Homes has hired Maxwell Security Company, a private contractor, to effect the removal of John Quigley. In addition to Maxwell Security's main force, they have brought in a "special extraction team" from Northern California to scale the tree, serve John Quigley, and possibly attempt to remove him from Old Glory. Maxwell Security and the L.A. County Sheriffs moved in to barricade Pico Canyon Road around the site of Old Glory at approximately 2:40 am on January 9, 2003. At that time, all seven volunteers were asked to vacate the premises, all of the children's artwork in support of saving Old Glory, all literature tables and the main tent which has housed the community supporters and volunteers was tom down and confiscated by Maxwell Security. Bill Rattazzi, of John Laing Homes, said that these actions are being taken at this time based on the complaints received by the "Concerned citizens" residing in the Southern Oaks Development of Stevenson Ranch. He said that the on-site presence of the Old Glory supporters was causing a "safety concern" for the residents. Pico Canyon beyond Southern Oaks Drive will remain blocked for an undetermined amount of time while Maxwell Security Personnel carry out their jobs. These activities are all taking place under the watchful eye of the L.A. County Sheriff's Department. Although, the L.A. County Sheriffs are not, at this point, directly responsible for the activities they did bring in their manpower to oversee the operations. We, the supporters of John Quigley and Old Glory, are concerned for the safety of John at the hands of these private contractors while the sheriffs stand idly by. We sincerely hope the sheriffs will protect the civil rights of John Quigley. We are also worried about the use of force and threats to intimidate John to exit the tree. We find it unfortunate that the county government has been unable to resolve this situation peacefully. We felt with the outpouring of support for the efforts to save Old Glory that we were receiving on a daily basis, would lead them to a conclusion in favor, consistent with the community supporters, to save Old Glory. Now is the time to register your support and concerns with Laing Homes and Supervisor Mike Antonovich. In addition to calling, please fax them a letter stating that you are a resident of his community and are in complete support of leaving Old Glory where she stands. In addition, mention that you do not like this forceful action, taking place under the guise that you the "concerned citizens of Southern Oaks" asked for these actions to occur. Contact information: Bill Rattazzi Laing Homes--phone: 818-830-3360 and fax: 818-830-6950/ Supervisor Mike Antonovich-phone: 213-974-5555 and fax: 213-974--1010. 6AM: On the orders of John Laing Homes, and in the dark of the night early this morning, Sheriff officers moved in and ordered all tree supporters under Old Glory to vacate the area immediately. They established a new barrier 100 yards south on Pico Canyon Road. The previous fence near Old Glory was removed, and all materials under the tree were removed. Tree climbers also removed some of John's materials in the tree, but John remains in Old Glory, protecting it as he did on November 1st. It was announced that the tree uprooting would start on January 15th (next Wednesday). Your support is needed now more than ever! Contact John Laing Homes and Supervisor Antonovich and tell them to let common sense prevail, and save Old Glory. Two letters of support were received from California Lieutenant Governor Cruz Bustamante and Los Angeles Mayor James Hahn. They may be viewed by clicking on the images below. Children from a Helen Estock Elementary School (Tustin), after learning about John and Old Glory, wrote and drew pictures about their experiences and from many points of view. To see these works, click on the drawing at the right. It is a large PDF file that is viewable with most web browsers. (You can save these works for later by right-clicking and selecting "Save Link As..." from the choices). Note: the file size is about 2.7MB, which will take about 15 minutes to load with a 56K modem. In late December, Valley Crest backed out of its deal to attempt to move the tree. It is good that they have admitted what almost all other competent arborists and tree movers have said all along: this huge tree cannot be moved. A group of supporters led by Rene Russo presented Antonovich's office with the professionally-drawn plans for an alternative roadway alignment that would spare the tree and safely separate traffic into proper lanes. However, it was not accepted, Antonovich continued his personal boycott of the press and tree supporters, and his aid rejected the plan sight unseen. The claim was made that alternatives were already examined, and that none were acceptable. However, neither the County not Laing has presented any evidence that even a single alternative had been proposed or evaluated before now. In early December SCOPE has filed but not yet served a lawsuit against Laing Homes, charging Laing with fraud, unfair business practices, breach of contract and breach of covenant of good faith and fair dealings when it broke a promise to devise a plan that would reroute the widening of Pico Canyon Road instead of chopping down the tree. The agreement can be viewed by clicking here or on the link below. Laing failed to produce plans for a soft-bottomed low-flow drainage structure, instead making only a fully-paved concrete culvert; Laing also failed to prepare alternative plans for road alignments which would spare the tree. These issues were the core of the agreement Laing signed. Failure to abide by the agreement, in combination with the County's lack of action to develop alternatives, leads one to believe that there was no intention to follow this agreement. During the three yearsa since signing, Laing has proceeded with homebuilding too close to the tree to allow a conventional road to bypass the tree, and has built the concrete drainage structure to the north of the tree that would make aligning road lanes expensive or impossible. The presence of such large crowds of supporters is a deterrent against any attenmpts to cut or move the tree. Please come again, expecially in the mornings, and help continue the protection from root-cutting that has been so successful! 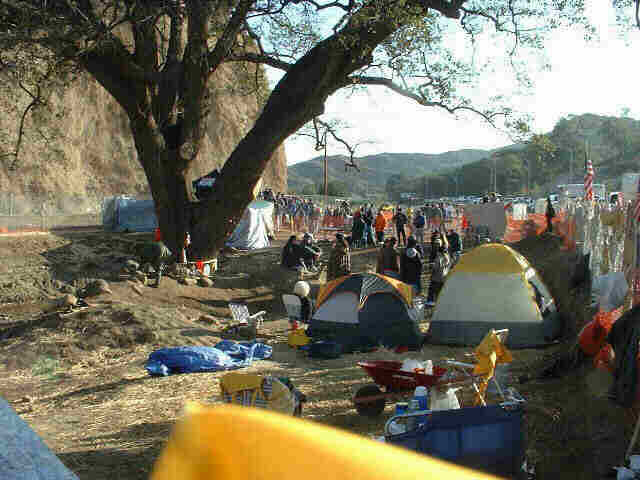 Come park at the site late evenings through mornings, or stop by, and protest the attempts to move the tree! Attend the protests at John Laing Homes this week. Contact Supervisor Antonovich, asking him to direct Public Works to realign the road to save the tree. Make a donation to support John; you can drop it off at the table in front of the tree. Three years ago, Laing Homes and the County of Los Angeles were ready to cut down this magnificent 400 year old oak tree to make room for the widening of Pico Canyon Road, required for the massive Newhall Ranch project to the northwest. The local environmental group SCOPE negotiated an agreement, in which Laing Homes agreed to work with the County Public Works department to realign the road and/or make other changes so that the tree could be saved. However, there seems to have been no such effort actually made by Laing or the County; the road plan remained at four lanes, the drainage was hard-paved, and the tree was still planned for removal. The agreement DOES NOT expire. However, the Public Works decision to delay forcing the widening of the road expired October 31st, and word was out that the tree would be cut down immediately. 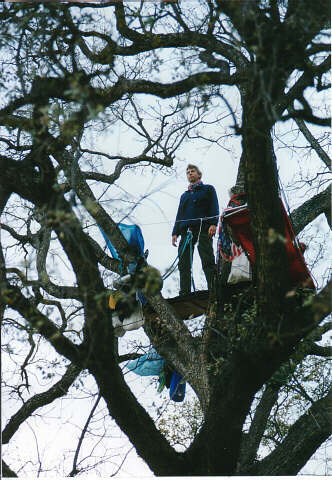 SCOPE searched its contacts in the environmental community and found John Quigley, an environmental lecturer, who agreed to climb the tree immediately to protest and prevent the destruction. John was chosen because he had done this one years before, and had the correct safety equipment to avoid injury climbing and staying in a tree that exceeds 70 feet in height. He is not being paid a fee or salary, but thanks to the generous donations from compassionate community individuals and SCOPE members, some of his expenses are being reimbursed. John has been in the tree since November 1st. County Supervisor Mike Antonovich ordered that the tree be moved 1/4 mile to the southeast, a decision that while supportive of saving the tree, will likely kill it, in the opinion of most arborists familiar with the tree. This is larger and older that any other tree the moving company has tried to move. The success rate in moving trees ranges from a high of 40% to a low of 10% for large old specimens. Click here for a FACT SHEET about Old Glory's situation. email the Webmaster for questions about this site.